Leigh Anne’s Restaurant serves a full breakfast menu six days a week. Come see us for home cooked omelettes, pancakes, biscuits, breakfast sandwiches, and more! Breakfast is served from 6am until 11am, Sunday and Tuesday through Friday, and from 6am until 2pm on Saturday. Serving breakfast for a crowd? Ask us about our breakfast catering! 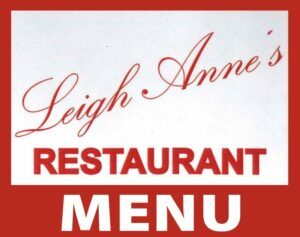 Leigh Anne’s Restaurant also serves lunch specials and has a full short order lunch menu. Choose from your favorite meats and vegetables, salads, sandwiches, hamburgers, chicken, fish, or our other delicious dishes. Lunch is served from 11am until 3pm, Sunday and Tuesday through Friday, and from 11am until 2pm on Saturday. Catering, bereavement dinners, and box lunches are also available. To view a PDF of our menu, please click here or on the image below.